The prosecco served at Lupo restaurant is fresh and bubbly, direct from the Montelvini winery near Venice, Italy. You’d never know it came out of a cardboard keg. The Yaletown eatery was a guinea pig of sorts -- the first Vancouver restaurant to sell quality Prosecco on tap. Co-owner Michael Mameli says the on tap process is far superior to the traditional bottle method. "You open the bottle and within a few hours the product deteriorates. It's not fresh, it's not as crisp. With this system it stays fresh, it stays crisp, the bubbles stay intact, so you can offer it by the glass and not have spoilage, not have waste," he told CTV’s Steele on Your Side. From Italian Prosecco on tap to B.C. wine on tap, this new foodie trend is allowing consumers to enjoy a nice glass of wine or bubbly without springing for the whole bottle. Wine on tap is allowing wine lovers to have some of the finest wine B.C. and other global wine regions have to offer. Aside from keeping the product fresh, wine in keg form cuts down on other costs too: freight shipping, product cost, breakage and spoilage. The new Tap and Barrel restaurant in Olympic Village is embracing the concept, with 14 wines on tap. Sommalier David Stansfield hand-picked the varieties, and says consumers are coming around to the idea that wine doesn’t have to always come in a bottle. When wine is poured through the glycol-encased tubes at Tap and Barrel, it’s the first time the vino has been exposed to oxygen because of a special cooling system. 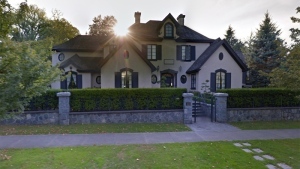 Owner Daniel Frankel admits he had to convince some B.C. wineries the quality of kegged wines could be controlled. Then he had to agree to buy 400 or 500 litres at a time. "And we were happy to do so,” he laughs. “We were, I guess, a little cocky and just bought into the concept and believed that the locals would as well. And luckily we were right, we're selling a lot of wine on tap." Frankel has already signed on to open a second location of Tap and Barrel at the Vancouver Convention Centre. Key to the wine on tap movement is a pair of young entrepreneurs. Mike Macquisten and Steve Thorpe run Vancouver Urban Winery in Railtown, a hip tasting room with over 30 premium wines on tap. Vancouver Urban Winery, the first business to keg bulk wines for restaurants and bars, is also a manufacturer, packager, importer and wine distributor -- storing quality wines in pressurized stainless steel tanks. "Vancouver and B.C. in general is a very wine savvy market, and it’s been amazing just to see how quickly people have gravitated to wine on tap,” said Macquisten. It's a concept that makes sense for many restaurant operators, says Thorpe. “You have zero spoilage -- it's environmentally friendly -- it increases your efficiency -- so it's a smarter, fresher, friendlier way to pour and consume wine,” he said. Many high-end local wineries have signed on to deal with Vancouver Urban Winery, including Laughing Stock, Nicol, Joie Farm and Le Vieux Pin. Thorpe and Macquisten have also released two of their own house wines under the brand Roaring Twenties: a New Zealand Sauvignon Blanc and an Argentinean Malbec. Not all B.C. wineries are convinced yet that wine on tap is here to stay. Frankel says some wineries are still uncertain about the technology, and says many wineries are still waiting on the fence, unwilling to commit. 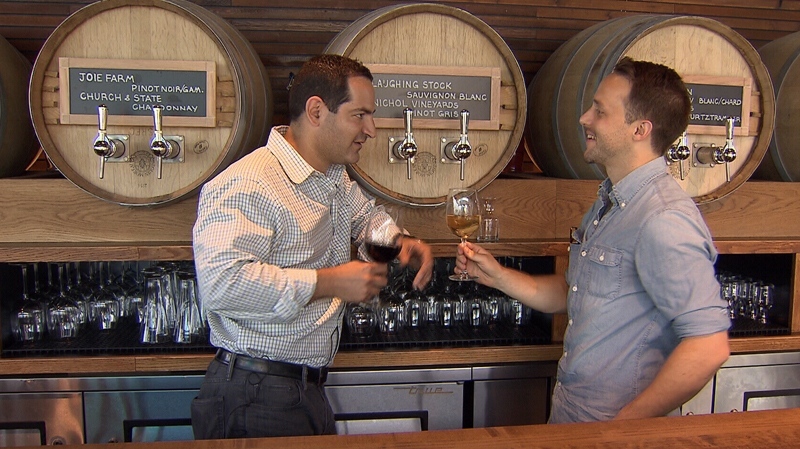 Wine on tap also appeals to diners who are worried about B.C.’s tough drunk driving laws. Instead of ordering a whole bottle and feeling compelled to finish it, you can order by the glass and keep your wits about you if you have to get behind the wheel.